Set at a height of 2550 meters above sea level, Mussoorie is a popular hill station located in the Garhwal Hills of the lower Himalayas. It is about 34 (38) km from Dehradun city in Dehradun district of Uttarakhand state. Its closeness to major Hindu pilgrimage sites like Kedarnath, Badrinath, Gangotri, Yamunotri, Haridwar, Rishikesh etc make Mussoorie a popular destination for the tourists. Its pleasant climate throughout the year and closeness to the Capital Delhi also adds to the attraction of the place.Mussoorie got its name from the Mansur shrub (Cororiana nepalensis), common in the Himalayan foothills. It offers fabulous views of the Himalayan ranges to the north east. This beautiful hill station was a discovery of an Adventurous British military Captain Young in 1827. Later this place developed as a centre of education, business, tourism and beauty. Mussoorie now has some of the best academic and training institutions like the Indian Administrative Services (IAS), Indo-Tibetan Border Police Academy, the Defense Institute of Work Studies, Indian Police Services (IPS) etc. Mussoorie also boasts Ruskin Bond, a prominent Indian writer of British descent as one of its famous residents. The Mall of Mussoorie is a favorite destination for tourists which gives this hill resort a different look Extending from the Library at one end to the Clock tower at the other, the mall offers stunning views of the surrounding hills and the Doon Valley below. One can enjoy horse riding through the crowded roads. The Library Chowk, Landour bazaars and the Kulri Bazaar (the famous centers in Mussoorie) form a part of the Mall and are must see places. These bazars offer the tourist a variety of Indian items. The Kulri Bazar has many interesting shops and offers a variety of attractive items. You can also find many antique shops here offering items that are reasonably priced. There is also a playground for children offering many games and rides. Camel's back Road and Cart Road also connect the two. Private vehicles are allowed on the Mall after paying a small fee, but cars are not allowed during the peak tourist season. 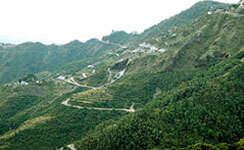 The second highest peak of Mussoorie, Gun Hill is the prime attraction in Mussoorie. The 2122 mts high peak offers the tourists a beautiful view of Mussoorie town, Doon Valley and some of the highest Himalayan ranges namely Bunderpunch, Srikantha, Pithwara and Gangotri group. In olden days a gun was kept atop the hill and fired at mid-day to pronounce the time and thus the name derives. When the Britisher's left, the gun was silenced and melted to make taps. One can reach the top of the gun hill either by walking or by using the rope way. If you prefer walking, you should take the pathway from the Mall Road near Kutchery which takes about 25minutes. The other alternative, a 400 m ropeway connecting the Mall to Gun Hill. Traveling through this ropeway gives the tourist a memorable thrilling experience. It is the most suitable road for the morning walks. It was built as a promenade and passes a rock formation that resembles the back of a camel - hence the name. It can be seen from a point near the gate of Mussoorie Public School. The place is also famous for the sunset view from here in the Himalyas. It starts from Kulri and end at the Library Chowk and is a very pleasant 3 km walk with the Camel's Rock en route. One can also enjoy horse riding here. All along the road there is a thick lining of deodar trees. The Hawa Ghar is the place to halt along Camel's Back Road. Municipal Gardens is another popular destination for tourists having a beautiful garden and an artificial lake with paddled boating facility. Situated in the midst of bamboo and deodar trees in the west, it is previously known as Company gardens (before independence) was also known as Botanical gardens of Mussoorie. These gardens were laid by famous geologist Dr. H. Fackner in the last century. They are easily accessible by car, pony or cycle-rickshaw. Located in Landour area, it is the highest point in Mussoorie which is considered the oldest occupied place in Mussoorie. The point is called Childer's lodge. A powerful telescope installed there in 1976 to provide a close up view of the Himalayas and Doon valley. Snow view from this spot is mind-blowing. One can go on horse back or on foot. Relatively a new picnic spot, it is about 6 Km from Mussoorie . It is an artificial lake where tourists can enjoy boating here. It offers a parnormic view of the Doon Valley and the surrounding villages. An ancient temple dedicated to Snake God Lord Shiva and is situated on Cart Mackenjee road is about 6 kms from Mussoorie on way to Dehradun. Vehicles can go right up to the temple. Place provides a enchanting view of Mussoorie & Doon valley. A perfect picnic spot which is 7 kms on way to Kempty falls. Rs. 25 to enter Lake mist. Good accommodation facilities are available here. These are the two other waterfalls in Mussoorie. Jharipani is 8kms from Mussoorie on Mussoorie - Jharipani Roadand Bhatta falls is 7kms from Mussoorie on Mussoorie-Dehradun road. Bhatta Falls is a different kind of picnic spot, there are separate ponds for bathing and water amusement here. A famous temple dedicated to Lord Bal Bhadra (Balraman), brother of Shri Krishna, is an ideal spot for trekking via Park Toll - Clouds end, Dudhi. 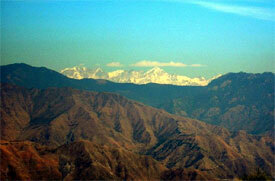 15 kms from Mussoorie, Bhadraj offers a picturesque view of the Doon Valley, Jaunsar Bhabar area and Chakrata ranges. Travel 15 kms from Mussoorie, one can reach the Kempty fall which is another prime attraction of Mussoorie. Not to mention this pretty and big waterfall surrounded by mountains is worth viewing. A bath in this fresh and cold water gives the tourist an refreshing feeling. The water fall from and height of 4500 feet and splits further into five small waterfalls makes the visit to Mussoorie a come again location. 18 km away from Mussoorie, Cloud's End is one of the first four buildings of Mussoorie and the most appropriate place for honeymooners. Built the Cloud End Bungalow in 1838 by a British Major Swetenham for his mountain bride. Spread over 400 acres, the bungalow now converted into a holiday resort but still keeps its original architecture, furniture, paintings, books. Besides offering a panoramic view of snow clad Himalayas and the Yamuna River, Cloud's end is surrounded by lush forests and houses a 44 species of flora and 103 species of fauna. It is accessible by road from the Library end of the Mall in Mussoorie. Located in Happy valley Area, this is a small Tibetan Temple which preaches Buddhism. Constructed in 1960 by the Tibetan refugees fleeing Chinese oppression in Tibet. There are some shops near which sells Tibetan handicraft items. Situated at an elevation of 2,750 m above sea level in the western part of tahsil Tehri, it is famous for the temple of Surkanda Devi. The peak offers an enchanting view of Dehra Dun, Rishikesh, Chandrabadni, Pratapnagar and Chakrata. It is surrounded by varieties of flowers, herbs and some of the beautiful birds of the western Himalayas. The temple of Surkanda Devi is situated on the top of the mountain and is of great religious significance. Ganga Dussehra a fair is usually held during May-June in which thousands of devotees visit this place.